I'm almost to the third trimester. 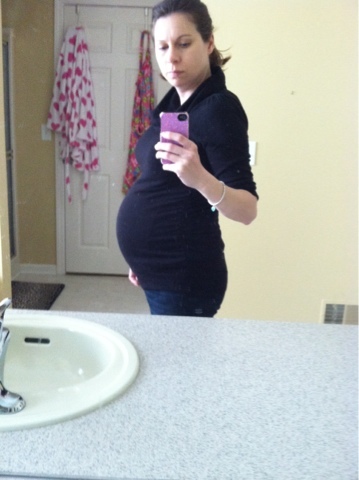 I'm 27 weeks and besides some pretty intense stretching pains I'm feeling pretty good. I'm sore most of the time and picking up Evelyn is getting harder but, I don't feel nauseas. I've gained 28 pounds which is a bit more than I was hoping for at this point but, my diets not too bad. I'm hungry all he time though so I know I'm eating more but I'm making healthier choices. We are heading to Alabama this weekend and I am looking forward to a vacation. Well I have lots of organizing and laundry to get done so I better get to it. I'll level you with a recent belly picture. I have been making more and more attempts to cut out processed food and make more things from scratch. Lunches seem to be a little harder because I tend to make the same type of sandwiches and it is so easy to just serve some chips with it. Evelyn and I both love chips and bread so it is our go to. Now that the weather is getting nicer we will be packing more lunches and going out to the zoo or park during the day. So, I am working on getting more creative with our lunch menu's. There is a blog that I follow called, 100 days of real food. It has a ton of information regarding nutrition and lots of ideas for how to make eating healthy and real food easy. I have noticed that on the days that Evelyn eats a lot of processed food and sugar that her attitude gets really whiny and she becomes very irritable. Since I have started to monitor her diet a little more I have noticed a change in her. I lately really started to watch the added colorings in so many of our processed foods. I am surprised at how many things that are called natural have these artificial colors added. It has been a challenge but, I keep reading labels and keep slowly cutting out these things that I think are unhealthy for our family. So, now on to the recipe. There are lots of ways this recipe can be switched up. Today, I stayed pretty basic but, next time I plan on getting even more creative with the fillings. This recipe is from www.100daysofrealfood.com, make sure you check it out. It has lots of great information. 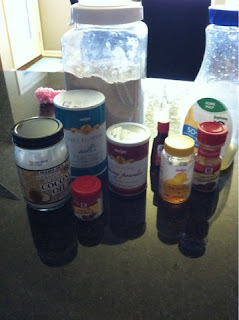 Make a well (hole) in the center of the flour mixture and pour in the eggs, honey, vanilla, oil and orange juice. Mix the dry and wet ingredients together – do not overmix. Now here is the fun part. If you are in a hurry just add 1 cup of blueberries, mashed up banana & nuts, or other filling of your choice. If you have 5 or 10 minutes extra (and some anxious helpers) do not add anything to the muffin batter before continuing with the next step. 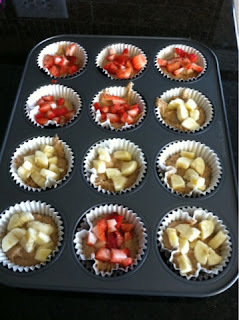 Line a muffin pan with liners and fill ⅔ to ¾ of the way full with batter. If you didn’t already add your filling, sprinkle 1 – 2 teaspoons of whatever you would like (from the list below or from your own creation) onto the top of each raw muffin in the pan. Then gently mix each one with a fork or spoon. Next time I am going to try a cinnamon and raisin. It's rainy again here in Michigan. I think it's going to rain all weekend. Now the question is, what to do with a busy toddler in side all day. Well, I think I have a plan. I found a couple of ideas for learning activities on pinterest. One of them are drawing shapes on the floor with masking tape and then jumping to the shapes. I think we will pick up the toys in the basement and try that one later. I'm also going to head to Walgreens to pick up some pictures and then to Ikea to get some frames. Maybe I can actually get them hung on the walls. We will probably stop at the craft store and pick up more paint and play dough too. I hope it starts to get nice out soon. I'm going a little stir crazy inside all the time. Today Evelyn and I went to the Bavarian Inn in Frankenmuth for Princess Day. 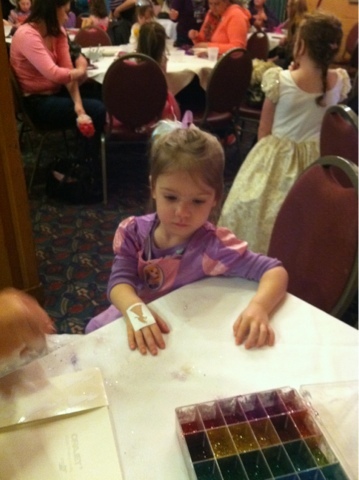 Evelyn was one of the youngest there but she really understood what was going on. 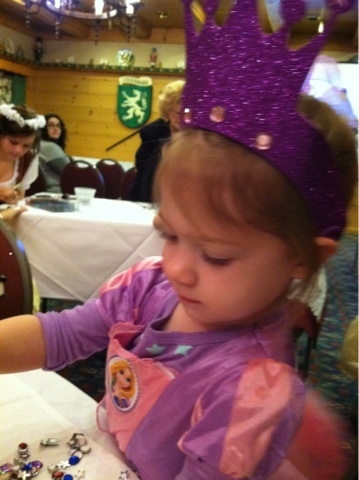 There were so many little girls all decked out in there finest princess outfits. The day started out with glitter tattoos and tiara decorating. 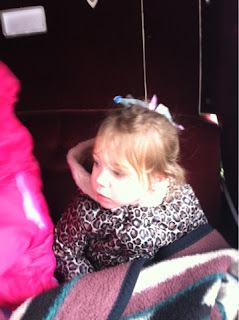 Then we took a ride in horse drawn carriage. Evelyn really liked this kart. Then there was a princess luncheon follows by a walk down the cat walk and a princess dance. 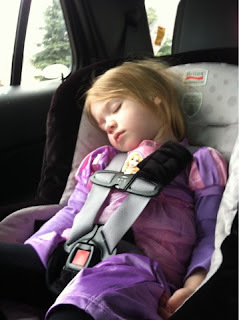 Evelyn was pretty tired after lunch do we missed the last two activities but it was still a great day. I hope to go annually.